I’m going to start off today by telling you about this promotion that Stampin’ Up is offering. 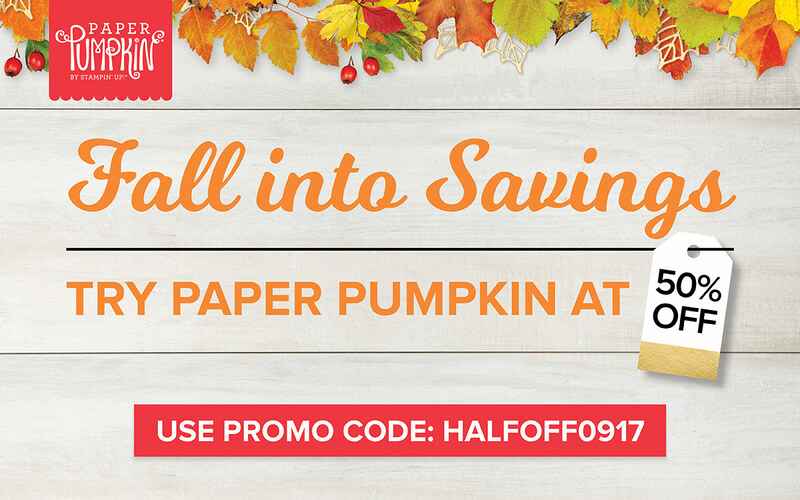 Today, August 11, 2017, through Monday, September 11, 2017, NEW subscribers can receive their first Paper Pumpkin box at 50% OFF!!! Just visit my paper pumpkin link to subscribe! Now… what sort of person would I be if I just left it there! Many of you may not even know what Paper Pumpkin is. Broken down into it’s most simple form…. 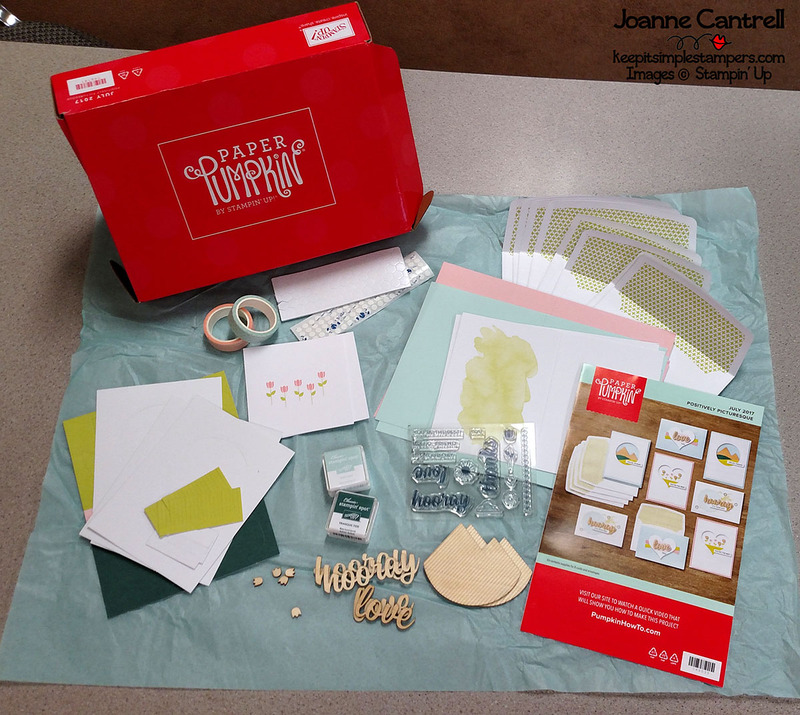 PAPER PUMPKIN IS A BOX OF FUN AND CREATIVITY DELIVERED TO YOUR DOOR EACH MONTH. Or, for those of you that prefer images… here’s the video! Still not convinced you need to subscribe to Paper Pumpkin? Here is the July 2017 Kit – Positively Picturesque. 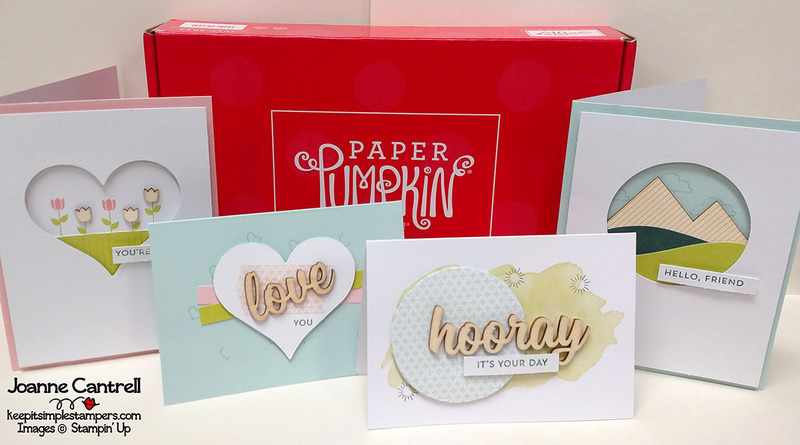 This kit came with enough supplies to make 8 cards – 2 each of 4 different styles. Look at those wooden elements! Those are soooo cool! Following the directions, I made one of each card. It took me less than 30 minutes. Making the other 4 as well would have only added about 5 more minutes. These were really simple! How cute are those. Perfect for all sorts of people and occasions. But, Paper Pumpkin isn’t always a card-making project. There have been treat sacks, boxes, tags, home décor… it’s really a surprise each month. Check out all the past kits on the Paper Pumkpin YouTube channel! And, you may just find yourself needing two subscriptions because there are a lot of alternative things you can do with the supplies instead of the ones in the directions. Check out Pinterest!